I wanted to make some granola that did not have any oats or other grains in it. Here it is: Grain-Free Granola. 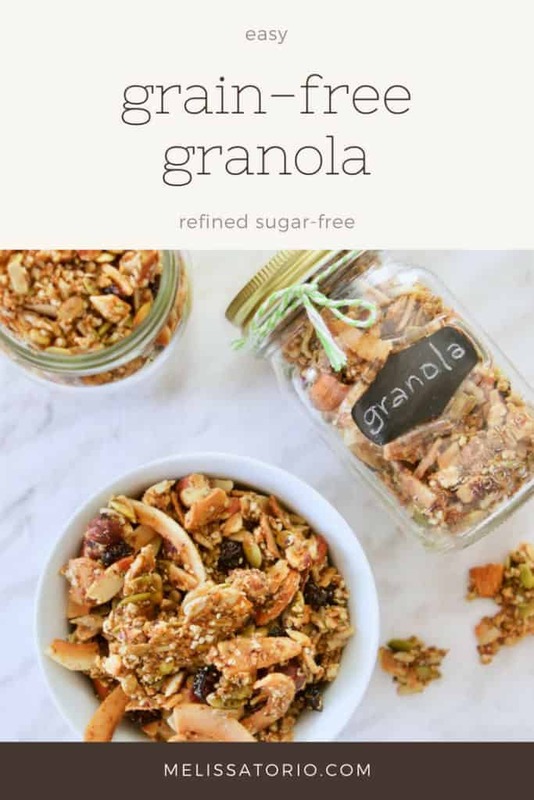 This granola recipe is so easy to make. 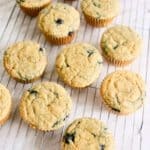 My kids enjoy this for breakfast with some homemade hazelnut milk. 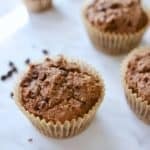 What do I need to make grain-free granola? We’ll be using nuts and seeds for this granola. Nuts are a great snack, with healthy fats and protein. I used almonds and hazelnuts. The seeds are pumpkin seeds, sunflower seeds and hemp seeds. 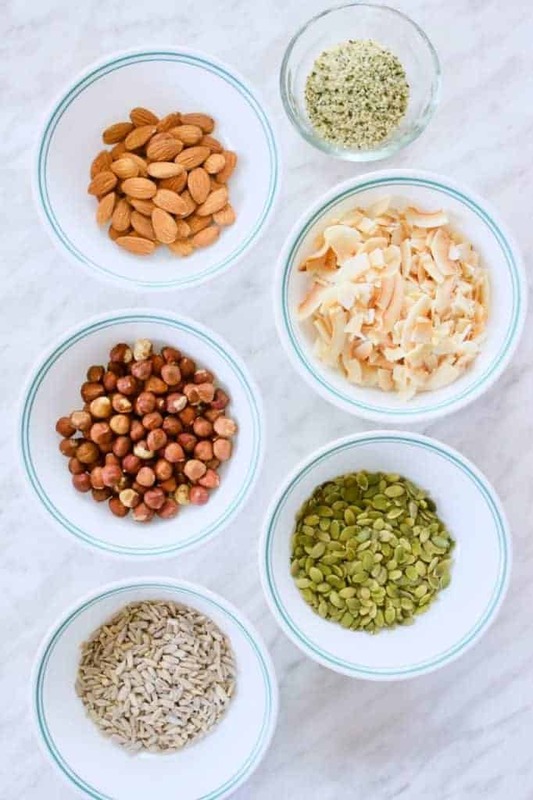 To make this nut-free: substitute more seeds instead of nuts. Coconut sugar and maple syrup are the natural sweeteners. 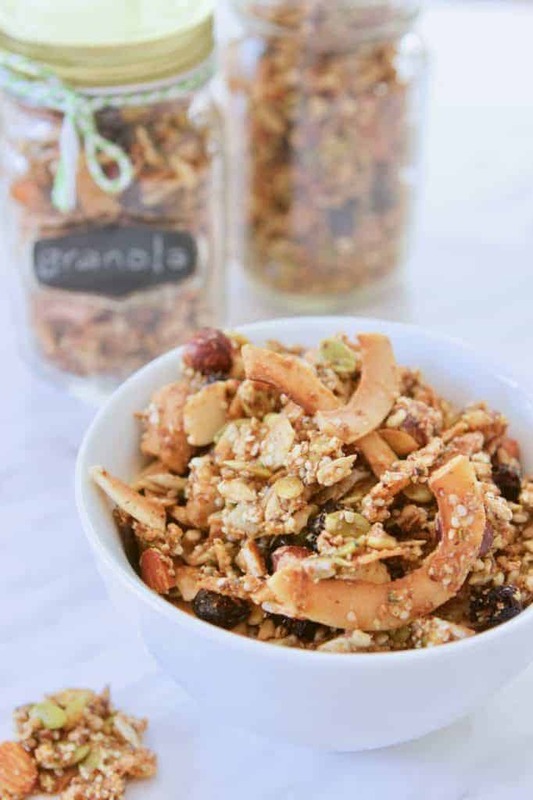 This granola recipe uses coconut in 3 forms: coconut flakes, coconut oil and coconut sugar. 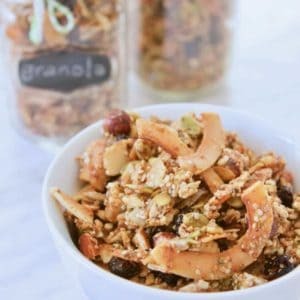 How do I make grain-free granola? Pre-heat the oven to 300ºF. Line 2 rimmed baking sheets with parchment paper. Roughly chop the nuts in a food processor or blender. I used my Magic Bullet. In a large mixing bowl, add the chopped nuts, seeds, coconut flakes, coconut sugar, cinnamon and sea salt. Set aside. In another bowl, add melted coconut oil. Stir in the maple syrup and vanilla. Pour the oil mixture into the granola mixing bowl. Mix everything together until the granola is covered evenly with the oil syrup mixture. Distribute the granola mixture onto the baking sheets. Spread evenly. Place the baking sheets on the middle rack in the oven. Bake for 30 minutes. After 20 minutes, open the oven, stir or mix the granola around the sheets. Remove from the oven and let cool. The granola should harden after cooling. Once cool, add the chopped dried cranberries, if desired. Store in airtight jars or containers. Enjoy this grain-free granola as a snack or breakfast. 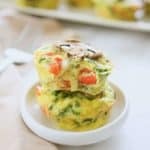 Let me know how you like this recipe! Please leave a comment or rating below. 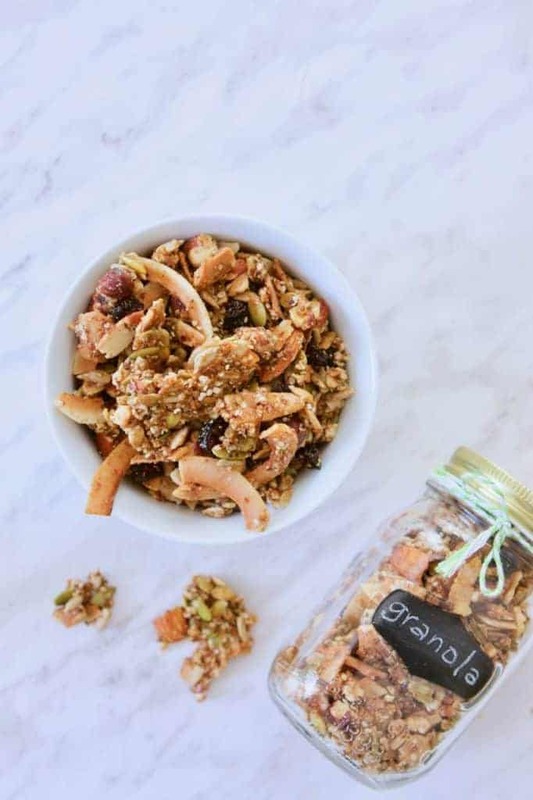 Try this easy and simple granola without any grains or refined sugar! Pre-heat the oven to 300ºF/150ºC. Line 2 rimmed baking sheets with parchment paper. Roughly chop the almonds and hazelnuts in food processor or blender or Magic Bullet. 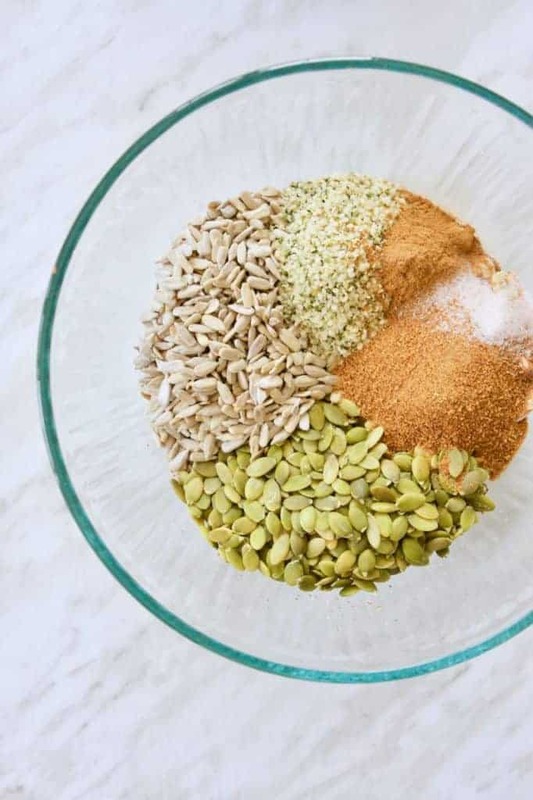 In a large mixing bowl, add the chopped nuts, pumpkin seeds, sunflower seeds, hemp seeds, coconut flakes, coconut sugar, cinnamon and sea salt. Mix thoroughly. In another bowl, add the melted coconut oil. Stir in the maple syrup and vanilla extract. Pour the oil syrup mixture into the granola bowl. Stir thoroughly until everything is coated as evenly as possible. 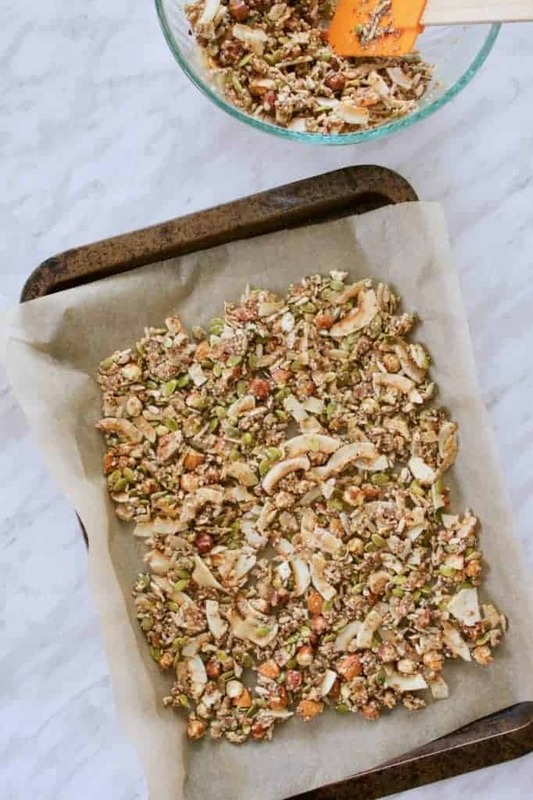 Distribute the granola mixture onto the 2 baking sheets. Spread around evenly. Place the baking sheets onto the middle rack in the oven. Bake for 30 minutes. After 20 minutes, stir or mix the granola around the sheets. Remove from the oven and let cool. The granola should harden as it cools. Once cool, mix in the chopped dried cranberries, if using. Place into airtight jars or containers. You may use others nuts, for a total of 1 1/2 cups of nuts. Or you may opt to use more seeds instead of nuts to make this recipe nut-free.